Do you have a food lover in your life? Someone who loves the latest kitchen gadgets? Someone who loves to experiment in the kitchen? A meal prepper? Or someone who loves food and is looking to expand their starter kitchen? Here’s a gift guide for that person in your life! 1 | An Instant Pot, $130 on Amazon. Not sure what an Instant Pot is? The Instant Pot is a brand name for a programmable electric pressure cooker that works magic in the kitchen. Check out my post here for more information. 2 | Nature’s Blossom Herb Garden Kit, $20 on Amazon. You know what’s always needed in the kitchen? Herbs! This kit lets you grow 5 herbs from organic seeds! 3 | Ultimate Organic Starter Spice Gift Set, $51.92 from Amazon. This wonderful set of spices from Simply Organic is a must for every pantry. 4 | Le Creuset, $349.95 from Amazon. A dutch oven is a staple in everyone’s kitchen. Get one that will last them for forever. 5 | Joule, $199, from Amazon. Do they love to experiment? Why not get them a sous vide! 6 | SodaStream, $124.99 from Amazon. 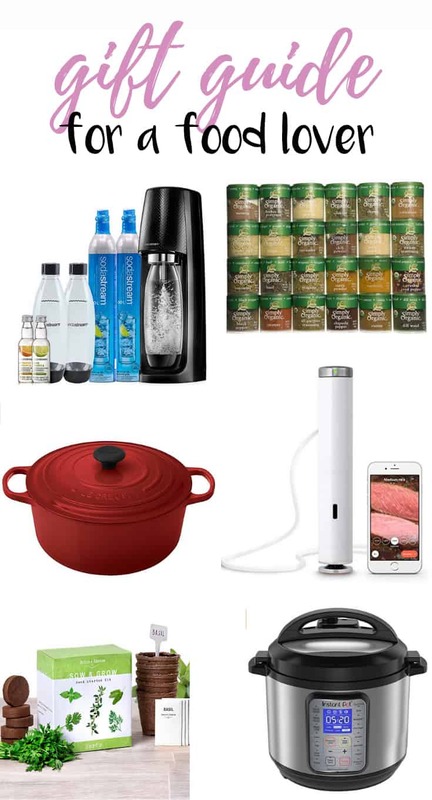 This SodaStream Fizzi Sparkling Water Maker Bundle, with extra CO2, Bottles and Fruit Drops is perfect for your friend who is in love with bubbly water or soda! 1 | Glasslock, $79.88 from Amazon. This is a 36 piece set (18 containers, 18 lids, 4 of each size) all natural glass containers with airtight lids. 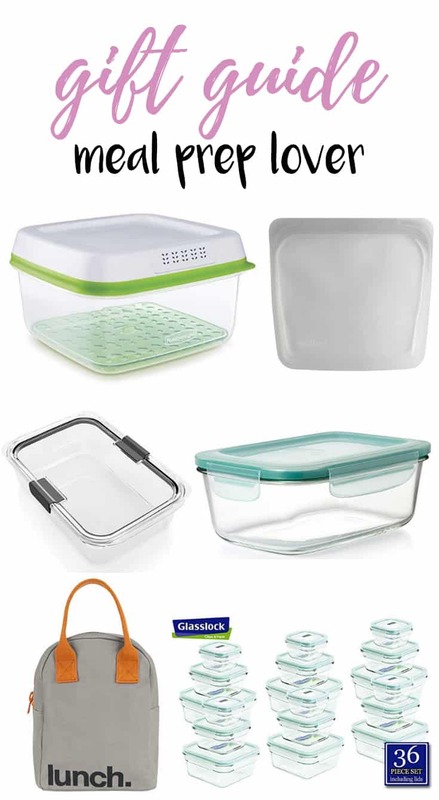 2 | Rubbermaid Brilliance Food Storage Container, $22.85 from Amazon. This large (9.6 cup!) container was hailed as the winner for the best large plastic container from America’s Test Kitchen. Leak proof, stain proof, and light weight! The larger containers are great for freezer items or for marinading. 3 | Oxo Good Grips Smart Seal Rectangle Container, $11.99 from Amazon. This large (8 cup) container is the other winner of the America’s Test Kitchen’s test as the best glass container. Leak proof, stain proof, with a plastic airtight lid. 4 | Stasher Reusable Silicone, $11.99 from Amazon. This silicon bag can be can be used in the freezer, microwave and dishwasher. It can be used in the oven, microwave, sous vide, or as a sandwich/snack bag! 5 | Rubbermaid FreshWorks Produce Saver Food Storage Container, $11.79 from Amazon. Save money, food, and trips to the grocery store with FreshWorks, it works by keeping produce fresher longer by keeping moisture out of the container to reduce spoilage. 6 | FLUF Lunch bag, $28.95 from Amazon. Made with organic cotton, this lunch bag is stink-free and washable. Plus it’s super cute. 1 | Butcherbox, $129/box. They offer hormone and antibiotic free meat delivered to your door! Use “AP10” for $10 off and free bacon in the first box! Shipping is free. 2 | Urthbox. Different delicious healthy snacks delivered to their doorstep very month! 3 | Avocado Monthly, $30/box. Got a friend who loves avocados? Get them shipped monthly directly from the source! 4 | MistoBox, $20/box. Is coffee the love of their life? Treat your coffee-loving friends with access to 500+ fresh-roasted coffee delivered from 50+ artisan roasters. 5 | Carnivore Club, $55/box. Is your first a charcuterie addict? Well, this is the perfect box for them! 6 | Love for Food by SnackNation, $7.99+/box. Got a snack lover? This is a snack-subscription service delivering a monthly curation of delicious, clean ingredient snacks. With every snack box delivered, Love With Food donates at least one meal to an American family in need through their partnership with Feeding America.